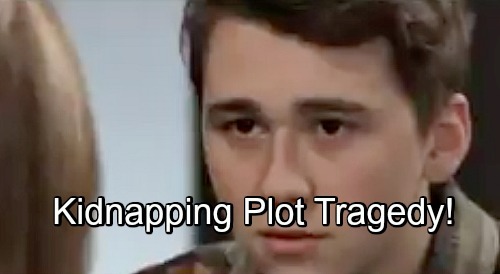 General Hospital (GH) spoilers tease that Oscar’s (Garren Stitt) emancipation hearing is coming up, so he’ll find himself feeling torn. Alexis (Nancy Lee Grahn) has helped Oscar see that it’ll be tough living on his own. Monica (Leslie Charleson) also encouraged Oscar to put up a fight and stick around. She wants him to have a shot at leaving his mark like the rest of the Quartermaine clan. Oscar will take all that into consideration, but part of him will still want true freedom. This is his life and there may not be much left of it. Oscar doesn’t want to be a human guinea pig and potentially cut his days short. On November 27, Alexis will express pride in Oscar. It’s possible he’ll relent and earn her approval that way. However, Oscar could just as easily make Alexis proud by following through on his plan. She already admires Oscar for standing up for what he wants. Oscar’s not quite a child and not quite an adult, so moving himself into the latter category early takes courage. Of course, Oscar must be getting plenty of support from that cult he inadvertently signed up for. That’ll become a crucial part of the story as time goes on. If Oscar wins his emancipation lawsuit, Kim’s (Tamara Braun) prepared to take drastic action. With Julian’s (William deVry) help, Kim’s devised a plan to kidnap Oscar and take him out of the country for a similar experimental treatment. Drew (Billy Miller) will obviously remain very much against this plan, but Kim doesn’t think it’s his call. She’s prepared to do whatever she has to do to save her son. Now that GH has introduced this potential kidnapping, it’ll be a letdown if they don’t do anything with it. Oscar may not actually be going to Brazil, but General Hospital needs to at least have a close call and the sting of Kim’s betrayal. It seems likely that this abduction will go horribly wrong in one way or another. Drew might tip Oscar off and give him a chance to hide out. Deep down, he appears to agree that this is Oscar’s choice to make. Drew hasn’t agreed to have his own memory reversal procedure, so he can’t blame Oscar for being afraid and hesitant. Then again, Oscar might get a hint on his own and flee to his cult friends. This could push him deeper into their dangerous drama. If Kim actually does make it out of the country with Oscar, perhaps the cult leader will intervene. GH fans don’t know how big this organization is or what kind of reach it has. This could be a much larger operation with some incredibly evil people running the show. Plus, this mess could make Oscar even more determined to avoid treatment. He could refuse the clinical trial as a revenge strategy to hurt Kim. In that case, perhaps Josslyn (Eden McCoy) would have to be the one to step up. There’s surely someone who can get through to Oscar and it just might be the person he loves most. General Hospital spoilers say some crazy twists are looming in Oscar’s storyline, so don’t miss them. We’ll give you updates as other GH news comes in. Stay tuned to the ABC soap and don’t forget to check CDL often for the latest General Hospital spoilers, updates and news.